Do you adore feel-good stories that leave you with a smile on your face? 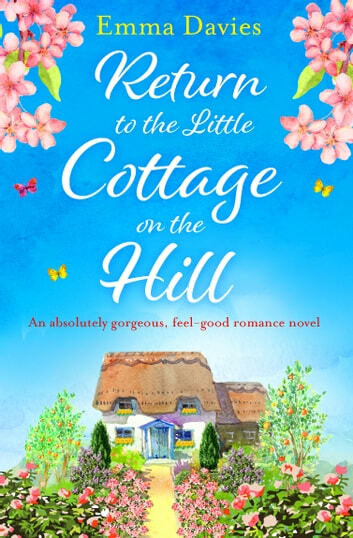 This heart-warming romance is a perfect escape for readers who flew through novels by Jenny Colgan, Lucy Diamond and Debbie Johnson. This is a continuation of the story of The Cottage on the Hill. You do not need to have read the first book but it helps to have had the backstory of how Seth and Maddie have been renovating the cottages for a retreat. This story is about Megan, an up and coming blacksmith who has entered a competition and is staying in one of the renovated cottages. She apprenticed under her father, as did, Julian. Megan is very talented at her craft and Julian is very jealous of her skills. Meanwhile, while the competition is being held on the grounds of the main house, the staff of Joy’s Acre Farm are the subjects of a documentary being filmed about “farm to table” in an original format. Declan wants to film Clara working in the garden, cleaning and harvesting her produce and then switch to Trixie in the kitchen preparing her masterpieces from those same fruits and vegetables. The book, as its subtitle, “An absolutely gorgeous, feel-good romance novel”, suggests is wonderful. You can just picture the gardens and the cottages. Each of the characters is eccentric in their own way but they are closer than most families. A quote from Agatha, the matriarch of the manor, that I especially liked – “Memories were not things that should be treated like precious ornaments, rarely touched and allowed to gather dust.” I look forward to more from Emma Davies. Great characters and so very warm and inviting. In the first two books of the series, we read of how Joy's Acre Farm is growing and how wonderful couples have found love. Here we have Megan Forrester's story. She is a young blacksmith and is visiting the farm in order to compete in a local craft competition. She is taking a risk, because, in so doing, she has to live in a long-distance relationship with her boyfriend Liam. But she can't think of Liam right now, or even the competition. What her initial focus is the sheer fact that she is pretty much starting over. She couldn't have picked a better place, however. As Megan will soon learn, Joy's Acre is a place of strong friends and a powerful connection. Meanwhile, there is a film crew at the farm producing a documentary. The purpose of the documentary is to show how rural businesses are impacting the small community. This could be a real boon to Joy's Acre. Or it could cause great headaches. Some of the people we happily remember from previous stories are Clara, Tom, Maddie, Seth and Trixie. They are a fine team that are working together to make Joy's Acre a resounding success, a place where individuals and families alike can take respite. One of the new people on scene is Declan, the head of the production company, and he and Clara take an interest in each other. The problem is timing. How will the two make a go of it? What of Megan and Liam? Will their long-distance relationship survive, especially when the competition that Megan is involved in becomes wrought with problems? This is the third book that I have read of Emma Davies and each one keeps getting better and better. There is so much warmth and connectivity that it makes me want to spend some time at Joy's Acre. I love the characters, the ongoing storylines and the angst that occurs in the story. There was even a shake-up with a couple of friendships in this book, bringing an extra sense of realism. Yet another reason to enjoy this story. For an engaging read that brings real warmth, then definitely pick up this book. There is one final book in the series that I am looking forward to, but I know that I will be sad to see it draw to a close. These are books that I'd love to have as paperbacks so I can easily grab them off of the shelf and re-read them. Many thanks to Bookouture and to NetGalley for this ARC to review in exchange for my honest opinion. Just love this series. What a lovely escape to visit Joy's Acre once again. Absolutely delightful.